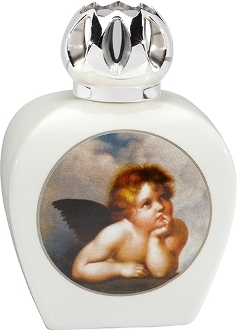 This beautiful Lampe Berger Angel lamp in ivory porcelain displays on both sides classic illustrations from a Raphael painting. It boasts a new open spherical silver top. The Lamp comes in a gift box with funnel, both tops, basic burner and a detailed instruction manual.